This modern and indeed contemporary tapestry "Shifting Sands" is a delightful work showing elements from the seaside. 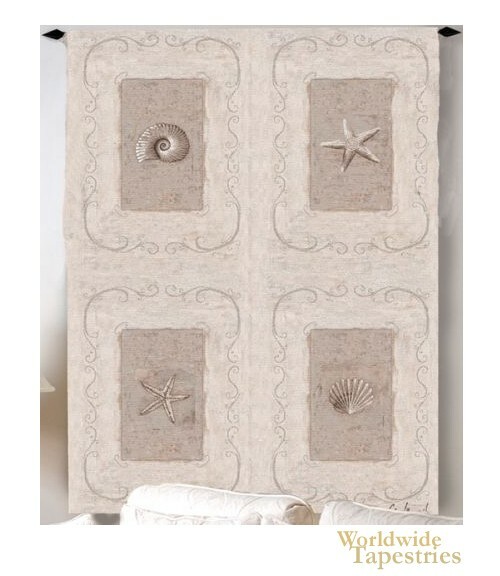 Whether you love the ocean front or live near the ocean and want to bring that fresh salt sense into your home to uplift, this wall tapestry with a seaside or ocean theme is just beautiful. Here we see sea shells, and starfish in a modern interpretation with subdued colors of beige to invoke the color of the perfect sandy beach. Each element is surrounded by an ornate curlicue design and texture to emulate the subtle variations on patterns in the sand. This modern beach or seaside tapestry "Shifting Sands" is backed with lining and tunnel for easy hanging. Note: tapestry rod, where pictured, is not included in the price.